Several years ago, I suffered a fall from a horse and was hurt pretty badly. I still feel the effects of that fall to this day, and am constantly speaking with my doctors and specialists as to the best way to make the pain go away. We’ve all felt pain at some point in our life, whether it be short-lived- or chronic pain that we must deal with on a daily basis. When I think about pain, and how we humans deal with it, I realize we can verbalize our pain. We discuss it with our doctors, our friends, family or most any sympathetic ear. We are wired to communicate, and we can verbalize our pain and discomfort with others and we then seek help to alleviate that pain. Our pets are different. Yes, they can whimper or yowl when they are in pain, but often when our pets are hurting, they suffer in silence. I want to offer some tips on how to recognize when your pet is in pain, and some potential solutions to alleviating it. It is also important to note that cats are masters of obscuring pain or illness. Whether it’s a natural instinct to hide a weakness from a predator or another reason, cats mask injury or illness very well- which is why it is so important for your cat to have regular, annual visits to their veterinarian. 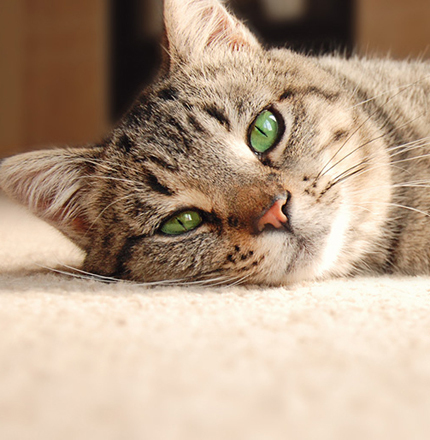 Often, we see cats when an illness has gone unchecked for several years without symptoms. What is pain in your pet? We all know what pain feels like, but how does one actually define it, or measure it? It can be very subjective. Two people suffering from an identical injury may define or describe it in radically different ways. When I was in the ER following my fall, I was constantly asked to rate my pain on a scale of 1 to 10. While my pain may have been a 6 or 7 to me, someone else who has a lower pain threshold may have rated it a 9 or 10. Similarly, a dog or cat with a thorn in their paw may be limping into the exam room but with extreme differences in temperament. One may be wagging their tail and the other crying in pain. So, pain can be subjective- and difficult to identify unless it is acute. Just because your pet is not limping, or showing obvious outward signs of aches or pains, it doesn’t mean they’re not hurting. Here are some not-so-obvious signs that they may need help. Biting. Most dogs usually don’t want to bite or snap at family members. 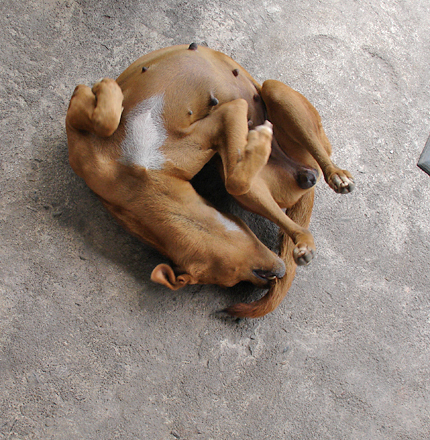 If you notice your dog snapping or biting when being handled, or when you touch your pet in a certain area, this could indicate a painful area on their body. Respiration. Some pets may pant and or have a more shallow breathing pattern when resting. If your pet hasn’t been running around or exercising and they’re panting, there’s a possibility they’re hurting. Eating and drinking changes. Often when pets are in pain, they may consume less food and water- even if the pain is not tooth or mouth related. If the pain does reside in the mouth or teeth, they will most likely drop food from their mouth. Heart rate increase. Painful dogs will often have an elevated resting heart rate. Anti-social behavior. Your pet may slowly become more detached and no longer wish to interact with family members. Resistance to play or exercise. This is common in older pets, where their favorite activities of chasing a ball or toy no longer interests them. Many pet owners write this off as old-age, but it could mean they don’t want to play simply because they hurt. Are drugs the only answer for your animal? Depending on age and overall health, pharmaceuticals are the most common course of treatment. Many drugs may have long-term adverse side effects, potentially impacting liver and kidney functions. Some NSAIDS (Non-steroidal anti-inflammatory drugs) provide dramatic results, but require us to perform bloodwork on a bi-annual basis to monitor organ function. We will discuss all of this with you to determine the best treatment for your pet. What are the alternatives for your animal? There have been great changes in both medicine and technology to alleviate pain over the past several years, so our use of drugs has decreased significantly. At TVH, we have seen excellent results with painful pets as a result of using laser therapy. To truly understand how it works, and listen to pet owners who have seen the improvement in their pets, we’ve posted a video on our YouTube page which you can see here. Laser therapy is available in single treatments or we offer discounts for three and six treatment packages. Other alternatives include stem cell therapy. This is different from the controversial topic of embryonic stem cells, and the stem cells we’re discussing actually come from your own pet. The process begins by removing fatty (adipose) tissue from your pet under general anesthesia. We then take the fat we have harvested and process it through a specialized machine, which breaks it down into the stem cells. We then inject the stem cells into painful joints, which then begin to heal. This procedure has shown remarkable results- more than 80% of pets who have undergone stem cell therapy have dramatic improvement in their mobility. Your pet’s stem cells are then banked if another procedure is required in the future. Stem cell therapy is a relatively new technology in the veterinary field. Like most other new technologies, it is somewhat expensive. We can discuss your pet’s age, activity level and other factors to determine if your pet is a good candidate. We can also look at dietary products designed to improve certain conditions such as joint pain and arthritis. There are a few diets we recommend that have shown positive results in painful pets. In addition to diet, we can consider nutraceuticals. Nutraceuticals is a broad term that is used to describe any product derived from food sources with extra health benefits in addition to the basic nutritional value found in foods. They can be considered non-specific biological therapies used to promote general well-being, control symptoms and prevent malignant processes. There are a wide variety of nutraceuticals available that can promote joint health and other issues. Talk with your veterinarian about what nutraceuticals may benefit your pet’s condition. At Tampa Veterinary Hospital, we want your pet to be both happy and healthy. It is difficult for a pet who is in pain to be happy and to enhance our daily lives. If you’re concerned that your pet is quietly suffering from pain, give us a call and set up an appointment to discuss the best option for your pet.